"Cavalry charge" redirects here. For the tactic used in various football codes, see cavalry charge (football). A charge is a maneuver in battle in which combatants advance towards their enemy at their best speed in an attempt to engage in close combat. The charge is the dominant shock attack and has been the key tactic and decisive moment of many battles throughout history. Modern charges usually involve small groups against individual positions (such as a bunker) instead of large groups of combatants charging another group or a fortified line. It may be assumed that the charge was practiced in prehistoric warfare, but clear evidence only comes with later literate societies. The tactics of the classical Greek phalanx included an ordered approach march, with a final charge to contact. In response to the introduction of firearms, Irish and Scottish troops at the end of the 16th century developed a tactic that combined a volley of musketry with a rapid close to close combat using swords. Initially successful, it was countered by effective discipline and the development of defensive bayonet tactics. The development of the bayonet in the late 17th century led to the bayonet charge becoming the main infantry charge tactic through the 19th century and into the 20th. As early as the 19th century, tactical scholars were already noting that most bayonet charges did not result in close combat. Instead, one side usually fled before actual bayonet fighting ensued. The act of fixing bayonets has been held to be primarily connected to morale, the making of a clear signal to friend and foe of a willingness to kill at close quarters. The shock value of a charge attack has been especially exploited in cavalry tactics, both of armored knights and lighter mounted troops of both earlier and later eras. Historians such as John Keegan have shown that when correctly prepared against (such as by improvising fortifications) and, especially, by standing firm in face of the onslaught, cavalry charges often failed against infantry, with horses refusing to gallop into the dense mass of enemies, or the charging unit itself breaking up. However, when cavalry charges succeeded, it was usually due to the defending formation breaking up (often in fear) and scattering, to be hunted down by the enemy. It must be noted, though, that while it was not recommended for a cavalry charge to continue against unbroken infantry, charges were still a viable danger to heavy infantry. Parthian lancers were noted to require significantly dense formations of Roman legionaries to stop, and Frankish knights were reported to be even harder to stop, if the writing of Anna Komnene is to be believed. However, only highly trained horses would voluntarily charge dense, unbroken enemy formations directly, and in order to be effective, a strong formation would have to be kept – such strong formations being the result of efficient training. Heavy cavalry lacking even a single part of this combination – composed of high morale, excellent training, quality equipment, individual prowess, and collective discipline of both the warrior and the mount – would suffer in a charge against unbroken heavy infantry, and only the very best heavy cavalrymen (e.g., knights and cataphracts) throughout history would own these in regards to their era and terrain. The cavalry charge was a significant tactic in the Middle Ages. Although cavalry had charged before, a combination of the adoption of a frame saddle secured in place by a breast-band, stirrups and the technique of couching the lance under the arm delivered a hitherto unachievable ability to utilise the momentum of the horse and rider. These developments began in the 7th century but were not combined to full effect until the 11th century. The Battle of Dyrrhachium (1081) was an early instance of the familiar medieval cavalry charge; recorded to have a devastating effect by both Norman and Byzantine chroniclers. By the time of the First Crusade in the 1090s, the cavalry charge was being employed widely by European armies. However, from the dawn of the Hundred Years' War onward, the use of professional pikemen and longbowmen with high morale and functional tactics meant that a knight would have to be cautious in a cavalry charge. Men wielding either pike or halberd in formation, with high morale, could stave off all but the best cavalry charges, whilst English longbowmen could unleash a torrent of arrows capable of wreaking havoc, though not necessarily a massacre, upon the heads of heavy infantry and cavalry in unsuitable terrain. It became increasingly common for knights to dismount and fight as elite heavy infantry, although some continued to stay mounted throughout combat. The use of cavalry for flanking manoeuvres became more useful, although some interpretations of the knightly ideal often led to reckless, undisciplined charges. Cavalry could still charge dense heavy infantry formations head-on if the cavalrymen had a combination of certain traits. They had a high chance of success if they were in a formation, collectively disciplined, highly skilled, and equipped with the best arms and armour, as well as mounted upon horses trained to endure the physical and mental stresses of such charges. However, the majority of cavalry personnel lacked at least one of these traits, particularly discipline, formations, and horses trained for head-on charges. Thus, the use of the head-on cavalry charge declined, although Polish hussars, French Cuirassiers, and Spanish and Portuguese conquistadores were still capable of succeeding in such charges, often due to their possession of the previously mentioned combination of the traits required for success in such endeavours. In the twentieth century, the cavalry charge was seldom used, though it enjoyed sporadic and occasional success. In what was called the "last true cavalry charge", elements of the 7th Cavalry Regiment of the United States attacked Villista forces in the Battle of Guerrero on 29 March 1916. The battle was a victory for the Americans, occurring in desert terrain, at the Mexican town of Vicente Guerrero, Chihuahua. One of the most successful offensive cavalry charges of the 20th century was not conducted by cavalry at all, but rather by mounted infantry, when on 31 October 1917, the Australian 4th Light Horse Brigade charged across two miles of open terrain in the face of Ottoman artillery and machine gun fire to successfully capture Beersheba in what would come to be known as the Battle of Beersheba. On 16 May 1919, during the Third Anglo-Afghan War, the 1st King's Dragoon Guards made the last recorded charge by a British horsed cavalry regiment at Dakka, a village in Afghan territory, north west of the Khyber Pass. During the Spanish Civil War, there was a massive cavalry charge by the Fascist’s division during the Battle of Alfambra on 5 February 1938, the last great mounted charge in Western Europe. After World War II, the cavalry charge was clearly outdated and was no longer employed; this, however, did not stop modern troops from utilising horses for transport, and in countries with mounted police, similar (albeit unarmed) techniques to the cavalry charge are sometimes employed to fend off rioters and large crowds. In the firearms age, the basic parameters are speed of advance against rate (or effectiveness) of fire. If the attackers advance at a more rapid rate than the defenders can kill or disable them then the attackers will reach the defenders (though not necessarily without being greatly weakened in numbers). There are many modifiers to this simple comparison – timing, covering fire, organization, formation and terrain, among others. A failed charge may leave the would-be attackers vulnerable to a counter-charge. There has been a constant rise in an army's rate of fire for the last 700 years or so, but while massed charges have been successfully broken they have also been victorious. It is only since the late 19th century that straight charges have become less successful, especially since the introduction of the machine gun and breech-loading artillery. They are often still useful on a far smaller scale in confined areas where the enemy's firepower cannot be brought to bear. Battle of Gaugamela (October 1, 331 BC) 1,800 Greek (Macedonian, Thessalian etc.) Companion cavalry, led by Alexander the Great himself and supported by brigades of hypaspists and part of his phalanx, charged and broke through the center of a huge Achaemenid army of more than 50,000 warriors led by Darius III, the emperor. 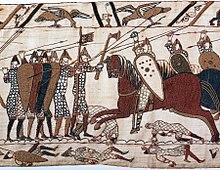 Depiction from the Bayeux Tapestry of Norman cavalry attacking Anglo-Saxons who are fighting on foot in a shield wall. Battle of Hastings (October 14, 1066): 2000 Norman heavy cavalry repeatedly charged uphill at several times their number in Anglo-Saxon infantry, who had formed a shield wall. All charges were repulsed until the Saxon infantry, thinking the Normans were retreating, broke their formation to follow them and were routed by the Norman cavalry. Battle of Dyrrhachium (October 18, 1081): 1,300 Norman cavalry under Robert Guiscard, Duke of Apulia, were initially repulsed by the Varangian Guard. The Varangian Guard were in turn routed by a counterattack to their flanks by Norman infantry, fled to the sanctuary of a nearby church which the Norman forces burnt down. The Norman knights then charged the Byzantine line again, and caused a widespread rout. First recorded instance of a successful and decisive 'shock' cavalry charge. Battle of the Golden Spurs (July 11, 1302): The French cavalry, consisting of many nobles, was defeated in battle by heavily armed Flemish militiamen on foot. The cavalry charge was cited to be rash and premature with the battlefield's many ditches and marshes blamed for the loss, and at a few points on the Flemish line the French horsemen did manage to break through before being surrounded and annihilated. However it also demonstrated that well-disciplined and heavily armed infantry could defeat cavalry charges, ending the perception that heavy cavalry was practically invincible against infantry. Battle of Bannockburn (23–24 June 1314) The mounted English knights under Edward II charged the Scottish lines without covering arrow fire and were slaughtered by the Scottish pikemen. Also in the same battle, the Scottish cavalry charged and routed the English-Welsh archers. Battle of Crécy (August 26, 1346): 29,000 French and allied troops charged 16,000 English soldiers on a gentle slope. Under heavy longbow fire, the charge was a total disaster, with the French army losing over 1500 knights, many of them from important noble families. Battle of Poitiers (19 September 1356): Unlike the other major battles of the Hundred Years' War, the French knights and men-at-arms attacked the English lines on foot in fear of what happened in Crecy. However, instead this led the English knights and men-at-arms to mount up and charge. The combined attack of longbowmen and cavalry charge defeated the French army. Battle of Agincourt (October 25, 1415): Dismounted French knights become bogged down in a charge against the outnumbered English forces. The charge was slowed and stalled by the thick mud of the Agincourt field, allowing the light English infantry to kill and capture many French knights and prominent French nobles. Battle of Patay (June 18, 1429): French heavy cavalry managed to catch a retreating English army by surprise, and for the first time succeeded in defeating the English longbowmen in a direct confrontation, marking a turning point in the Hundred Years' War. The Battle of Nagashino saw the use of firearms to defeat Takeda Katsuyori's cavalry tactics. Battle of Nagashino (1575) – Charge of Takeda clan cavalry against massed arquebusiers behind stockades and supported by other infantry fails with heavy losses. Battle of Gembloux (January 31, 1578): 1,200 Spanish cavalry led by Alexander Farnese, charged into a Protestant army 25,000 men strong. 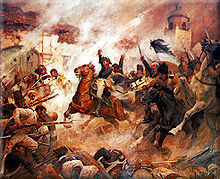 After the first clash with the enemy cavalry, the Spanish cavalrymen assaulted the infantry, resulting in 6,000 killed and the total destruction of the Protestant army. Battle of Kircholm (September 27, 1605) – Polish cavalry 2,600 men supported with 1,000 infantry defeated 11,000 Swedes. Polish-Lithuanian winged hussars charged and completely defeated advancing Swedes. Battle of Klushino (4 July 1610) – Polish forces numbering about 4,000 men (of which about 80 percent were the famous 'winged' Polish hussars under Hetman Stanisław Żółkiewski defeated a numerically superior force of about 35,000–40,000 Russians under Dmitry Shuisky, Andrew Golitsyn and Danilo Mezetski. In battle many formations of hussar units charged 8 – 10 times. Battle of Vienna (September 11–12, 1683): 20,000 Polish, Austrian and German cavalry led by the Polish king Jan III Sobieski and spearheaded by 3000 heavily armed Polish hussars charged the Ottoman lines. This is the one of the largest cavalry charges in history. 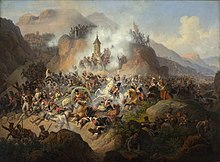 During the Battle of Somosierra, Spanish positions were overwhelmed in a combined arms attack, sending Polish uhlans at the Spanish guns, while French infantry advanced up the slopes..
Battle of Eylau (February 8, 1807): 11,000 French cavalry under Joachim Murat charge the centre of the Russian army to save the French army of Napoleon. Battle of Somosierra (November 30, 1808): During the Peninsular War Napoleon overwhelmed the Spanish positions in a combined arms attack, charging the Polish uhlans or Chevau-légers of the Imperial Guard at the Spanish guns while French infantry advanced up the slopes. The victory removed the last obstacle barring the road to Madrid, which fell several days later. Battle of Salamanca (July 22, 1812) Described as probably the most destructive charge made by a single brigade of cavalry in the whole Napoleonic period, Major General John Le Marchant's heavy cavalry brigade (5th Dragoon Guards, 3rd and 4th Dragoons) destroyed battalion after battalion of French infantry. Battle of Borodino (September 7, 1812) Three cavalry corps containing French, German and Polish regiments struck the enemy's centre. The Russian cavalry counter charged and this led to a general cavalry battle. Battle of Dresden (August 27, 1813) French cavalry under Marshal Murat succeeded in cutting off and annihilating the Allies' left wing. Several Austrian infantry divisions were caught in the open with inoperable muskets (due to heavy rains) by the French combination of cavalry and horse artillery and thus suffered heavy casualties, many soldiers surrendering. Napoleon's forces achieved a great victory. Battle of Waterloo (June 18, 1815): Two brigades (about 2,000 men) of the British heavy cavalry charged and annihilated the advancing French infantry (14,000 men) on the left flank of the Allied army. Later during the battle, the French cavalry mounted an attack with 9,000 men on the Allied infantry positions in the centre, but were unable to break the infantry's squares. The Charge of the Light Brigade, a charge of British light cavalry against a larger Russian force, was made famous because of Lord Tennyson's poetic retelling of the events. Charge of the Light Brigade (October 25, 1854) at the Battle of Balaclava in the Crimean War. Due to faulty orders a tiny force of 670 British light cavalrymen charged an enemy force many times their size. They succeeded in breaking through as well as disengaging, but suffered extremely heavy casualties and achieved no important objectives. Battle of Gettysburg (July 2, 1863) After running out of ammunition, Col. Joshua Chamberlain ordered the 20th Maine Volunteer Infantry Regiment to fix bayonets and charge down the hill at the 15th Regiment Alabama Infantry. Shocked by the movement, the Confederates ran down the hill. After the charge, the 20th Maine had captured most of the 15th Alabama. 262 soldiers of the 1st Minnesota Volunteer Infantry regiment charged a Confederate infantry unit in order to gain five minutes of time for the army of the Potomac. During the charge the regiment suffered 82 percent casualties. After the charge only 40 men were left, making it the worst single loss of any unit in the American Civil War. Pickett's Charge (July 3, 1863) at the Battle of Gettysburg in the American Civil War. Mass infantry assault on the Union lines but was bloodily repulsed by Union forces. Third Battle of Winchester (September 19, 1864): the largest cavalry charge of the American Civil War. Battle of Franklin (1864) (November 30, 1864): the largest infantry charge of the American Civil War. Battle of Wörth (August 6, 1870): French heavy cavalry brigade, with two squadrons of light cavalry, charges Prussian infantry in the village of Morsbronn, lost 800 men and the battle. Battle of Mars-la-Tour (August 16, 1870): "Von Bredow's Death Ride". Prussian heavy cavalry brigade overrun French infantry and artillery to reinforce left flank of Prussian Army, at cost of half the brigade. One of the few notable examples of successful cavalry charges after the introduction of modern firearms. Charge of the 21st Lancers in the Battle of Omdurman, September 2, 1898: 400 British cavalry charge 2,500 Mahdist infantry. This was also one of the first battles Winston Churchill engaged in, and was accurately described in his first book, The River War. Relief of Kimberley (13 February 1900): Major-General John French led a charge of 7500 cavalry through Boer lines to lift the Siege of Kimberley during the Second Boer War. Photograph depicting the Australian Light Horse charging towards the Ottoman position during the Battle of Beersheba. Charge of the 4th Light Horse and the 12th Light Horse in the Battle of Beersheba (October 31, 1917): two regiments of Australian Light Horse charge an unknown number of entrenched Turkish infantry and Austrian artillery. Battle of Moreuil Wood, March 30, 1918: An engagement in World War I, during the German's 1918 Spring Offensive, where the Canadian Cavalry Brigade attacked and forced the German 23rd Division to withdraw from Moreuil Wood. Charge of the 7th Dragoon Guards, November 11, 1918: British cavalry make an opportunistic charge on German infantry to capture Lessines and the Dender crossings in Belgium. The last cavalry charge of World War I, with the action completed as the clocks were striking 11 o'clock to mark the end of hostilities. Battle of Komarów (August 31, 1920): a vital and decisive battle of the Polish–Soviet War. It was the largest and last great cavalry battle of significance in which cavalry was used as such and not as mounted infantry. The British army's last cavalry charge by a complete regiment was executed in Turkey during the 1920 Chanak Crisis, when the 20th Hussars successfully charged a body of Turkish infantry. Charge at Krojanty (September 1, 1939): a cavalry charge that gave birth to the myth of Polish cavalry charging German tanks. In fact, Polish cavalry charged a regiment of German soldiers and were surprised by the arrival of a group of armored cars and retreated. Battle of Bataan (January 16, 1942): the 26th Cavalry Regiment of the United States makes a mounted pistol charge against Japanese positions, the last mounted charge in battle by conventional United States troops. Charge of the Savoia Cavalleria at Isbuscenskij, (August 24, 1942): the last cavalry charge of Italian history against a regular enemy formation. It was mounted against a Soviet artillery position along the River Don by 700 men of the 3rd Cavalry Division Eugenio di Savoia. This is often reported as "the last successful cavalry charge in history". Battle of Poloj (October 17, 1942): The last charge of an Italian horse regiment during WWII. It was executed in Yugoslavia by the 14th Light Cavalry Regiment "Cavalleggeri di Alessandria" versus Communist partisans. Battle of Schoenfeld was the last charge of the Polish 1st Cavalry Brigade just before the end of WWII. On March 1, 1945, it attacked the German lines in support of Soviet forces. The charge was successful. Battle of Mount Tumbledown (June 13–14, 1982): British infantry charge Argentine positions in the Falklands War. The last successful British bayonet charge until 2004. Battle of Vrbanja Bridge (May 27, 1995): the French Commandos Marine launched a bayonet charge to retake a sangar held by the Army of Republika Srpska at Suada and Olga bridge (formerly called "Vrbanja bridge") in Sarajevo, during the Bosnian War. It was the first bayonet charge for the French since the Korean War. ^ Connolly, Peter (1981). Greece and Rome at War. London: Macdonald Phoebus. p. 47. ISBN 978-0-356-06798-8. ^ Hill, J. Michael (1999). "Chapter 6 : Gaelic Warfare 1453–1815". In Black, Jeremy (ed.). European Warfare 1453–1815. London: Macmillan Press. pp. 201–224. ISBN 978-0-333-69224-0. ^ Holmes, Richard (1987). Firing Line. Harmondsworth: Penguin. pp. 377–9. ISBN 978-0-14-008574-7. ^ Nicolle, David (2011). European Medieval tactics (I). Botley, Oxford: Osprey. pp. 24–8. ISBN 978-1-84908-503-8. ^ Boot, Max (2003). The Savage Wars of Peace: Small Wars and the Rise of American Power. New York: Basic Books. p. 199. ISBN 978-0465007219. LCCN 2004695066. ^ Beede, Benjamin R. (1994). The War of 1898, and U.S. interventions, 1898–1934: an encyclopedia. Taylor & Francis. pp. 218–219. ISBN 978-0-8240-5624-7. ^ "First World War.com - Primary Documents - General Pershing on Military Operations in Mexico, 30 March 1916". firstworldwar.com. Retrieved 31 October 2015. ^ "1899 to 1938 – A Short History of 1st The Queen's Dragoon Guards". Regimental Museum of the 1st The Queen’s Dragoon Guards (The Welsh Horse). Retrieved 24 July 2015. ^ "Afghanistan". Regimental Museum of the 1st The Queen’s Dragoon Guards (The Welsh Horse). Retrieved 24 July 2015. ^ C. Peter Chen. "Battle of Moscow". WW2DB. Retrieved 31 October 2015. ^ "The Last Charge". Archived from the original on 2008-07-23. Retrieved 31 January 2008. ^ "Cavalry Lasts – The Last Cavalry Charge". GlobalSecurity.org. Retrieved 31 January 2008. ^ John Skow (23 November 1987). "In Kansas: Echoing Hoofbeats". Time. Retrieved 12 May 2009. ^ "Kluszyn 1610, Battle between Polish Commonwealth and Russia (Moscovy)". kismeta.com. Retrieved 31 October 2015. ^ "The Royal Dragoon Guards: History and Tradition". Archived from the original on 2007-10-21. ^ Newton, Cecil. "Short History of the 4th/7th Royal Dragoon Guards". ^ John Pike. "Cavalry Lasts - The Last Cavalry Charge". globalsecurity.org. Retrieved 31 October 2015. ^ "Poland in Exile - 1st Polish People's Army". polandinexile.com. Retrieved 31 October 2015. ^ "French peacekeepers assault on the Vrbanja bridge – Bosnian war / French video – French videoları – – Bilgibende.com sayfa 2". video.bilgibende.com. Archived from the original on 2016-03-04. Retrieved 2015-06-30. This page was last edited on 3 April 2019, at 19:13 (UTC).